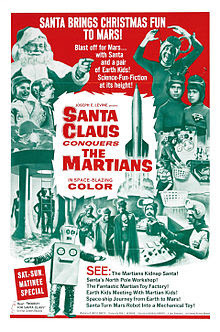 This week, your friends Count Vardulon and DM check out the '60s Xmas classic Santa Claus Conquers the Martians. And yeah, it's not great. Tune for a list of bad Christmas movies, most of which the Count and DM haven't seen, and stay for a rant about Jeopardy. I thought of 2 things as soon as I heard "worst christmas movies". Last Ounce of Courage which is almost as absurdly delusional about the "war on christmas" as Count exaggerated it. Kid gets suspended for being in possession of a bible in his locker and no one is allowed to set up nativity scenes on any of their lawns. The second is Grandma Got Run Over by a Reindeer. An animated movie as stupid as you could think making a movie based on that song would go. What christmas really needs is more stories about fraudulent lawsuits and in depth discussions about corporate buy outs and monopolies. That first one sounds like a Christmas version of Footloose. I'm glad I'm not tuned into Xmas movies; with few exceptions they're all kinda terrible. Those exceptions are Mickey's Christmas Carol, Muppets Christmas Carol, and Scrooged.